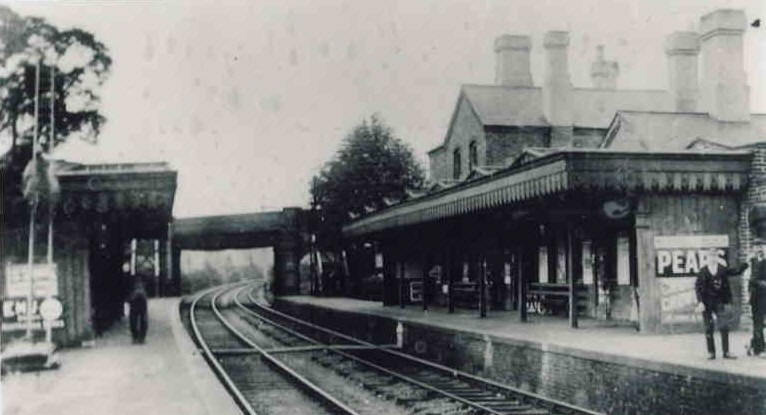 Hackbridge Station looking towards Carshalton in 1900-1914. The London, Brighton & South Coast Railway ran services from New Cross northwards through the East London Line's tunnel under the Thames to Liverpool Street. 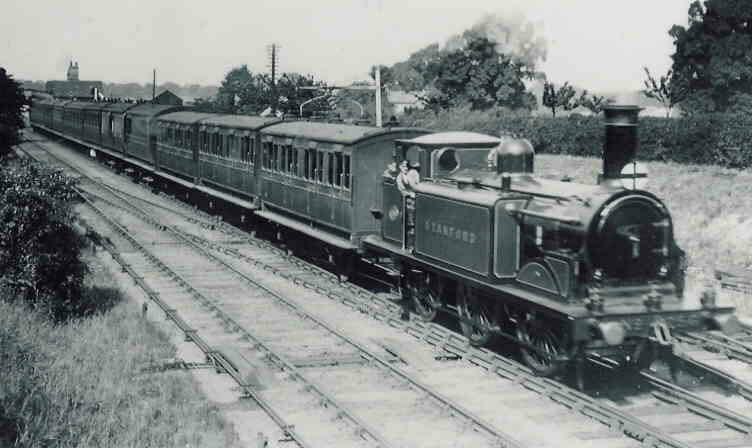 A number of A1 class 'Terrier' tank engines were equipped with condensing apparatus for the purpose, among them number 59 'Cheam'. This wonderfully posed photograph was taken at Shoreditch in 1900. 'Cheam' was re-numbered 659 on 1st June 1901. The goods shed at Wallington, with the signal box high above the station behind it. Note the hand-operated crane to the left of the picture, a feature of most goods yards of the period. Stoudley's A1 class of 0-6-0 'Terrier' tank engines carried names of many places from the Borough of Sutton. Built as no. 58, 'Wandle' was renumbered 658 on 1st June 1901, thus allowing us to date this picture as having been taken between then and the locomotives withdrawal from service in March 1902. Other local names carried by this class of locomotives include 'Ewell', 'Sutton', 'Surrey', 'Morden' and 'Waddon'. The first overhead electric train to arrive at Beeches Halt from London on 1st April 1906. Beeches Halt was upgraded to Carshalton Beeches Station in 1925. 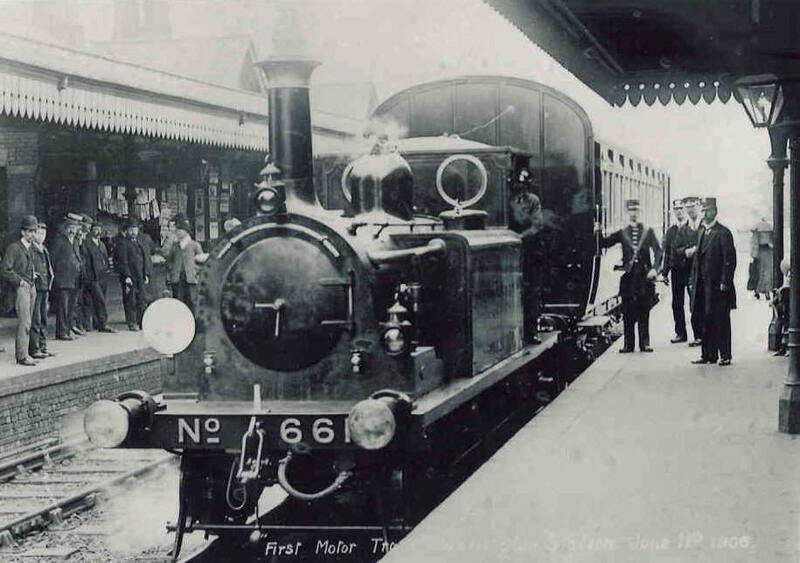 The first motor train arrives at Wallington. Motor trains were developed to speed up turn-around times. A locomotive was able to run equally well backwards and forwards, but, generally had to be uncoupled at the end of the line to run round the train and be re-attached to the front so the driver was able to see the line ahead. Motor trains had a small driving compartment built into the end of the carriage with large windows, and controls for the steam regulator and brake. A motor train leaving Carshalton Beeches in the direction of Wallington. The driver is seated at the front of the coach leading, in a specially adapted compartment with windows and controls enabling the engine to propel the train from behind. 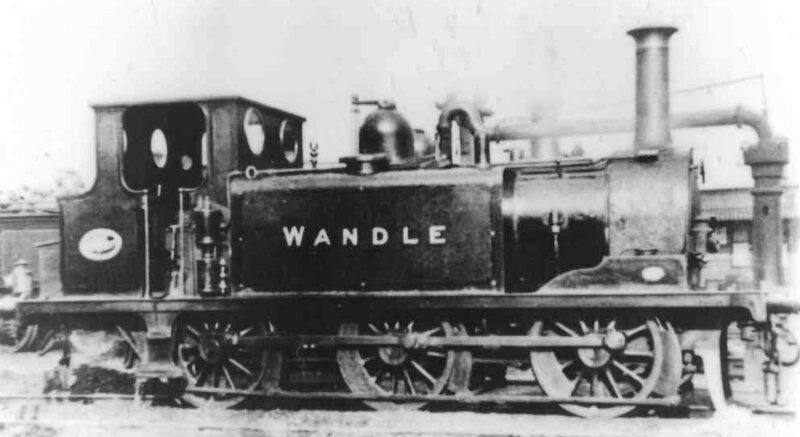 Stroudley's D1 class of 0-4-2 tank locomotive No. 256 'Standford' was built for the London, Brighton & South Coast Railway in March 1882. 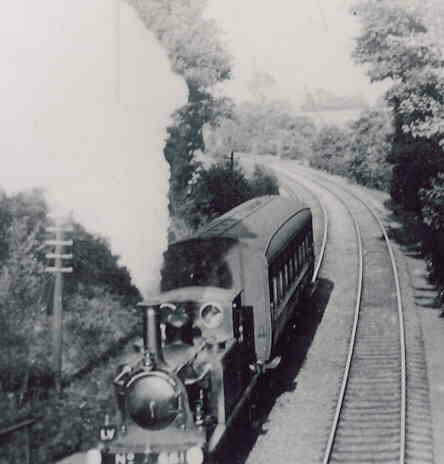 It is seen here in 1906 leaving Cheam en-route to London Bridge by way of Peckham Rye. 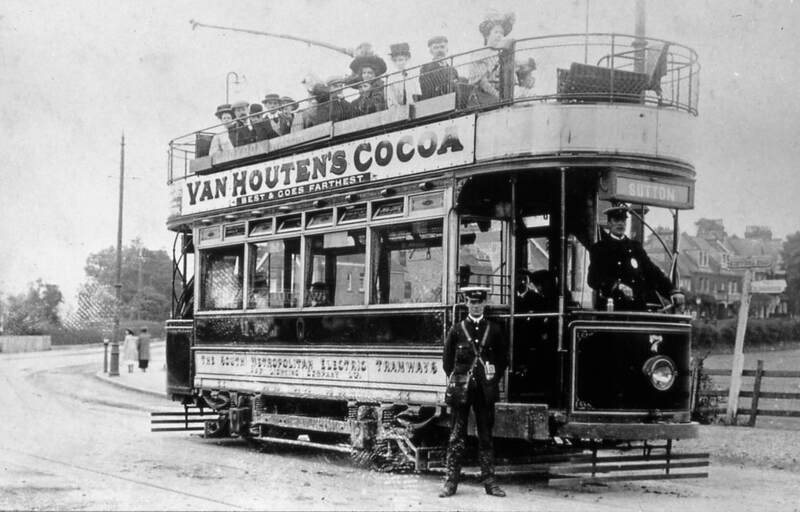 A very early posed photograph taken outside Sutton Tram Depot in Westmead Road. SMET cars 12 and 16 are probably pictured soon after the Depot opened in 1906. 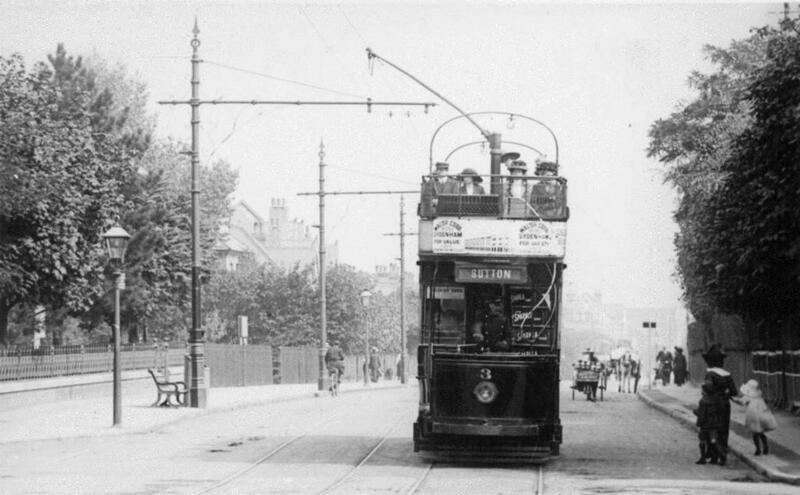 The trams preceded trolleybus route 654 between Sutton, West Croydon and Crystal Palace, and were run by the South Metropolitan Electric Tramways and Lighting Company (SMET). 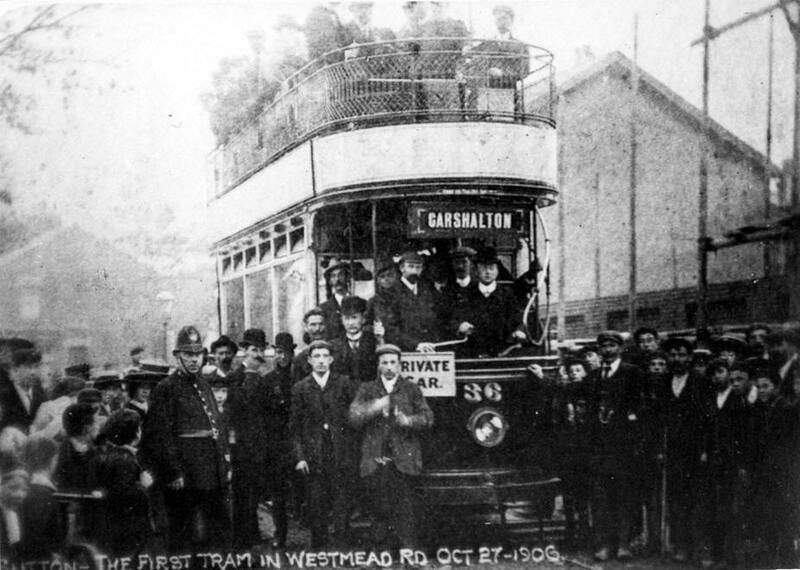 The first tram along Westmead Road on October 27th 1906. As with so many pictures of the era, it was specially posed. Nice to see a policeman on hand in case the occasion turned unruly!! 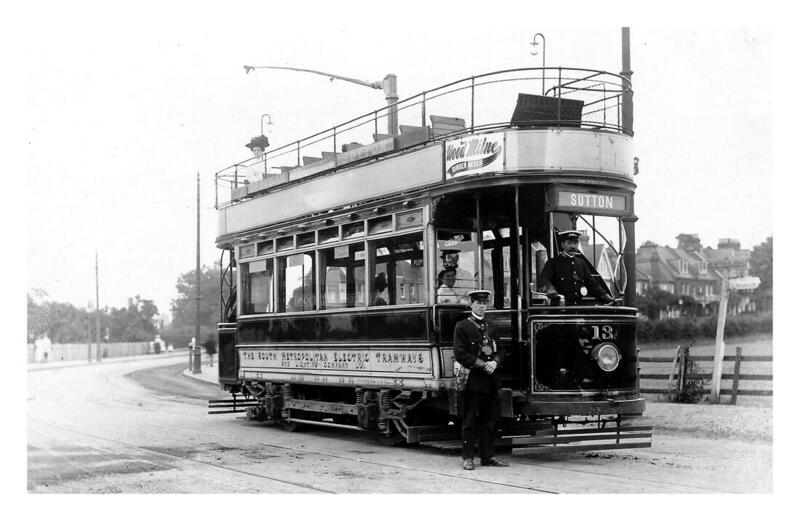 Conductor and motorman pose in Stafford Road with Tramcar No 7 - photo undated but probably 1906/7. 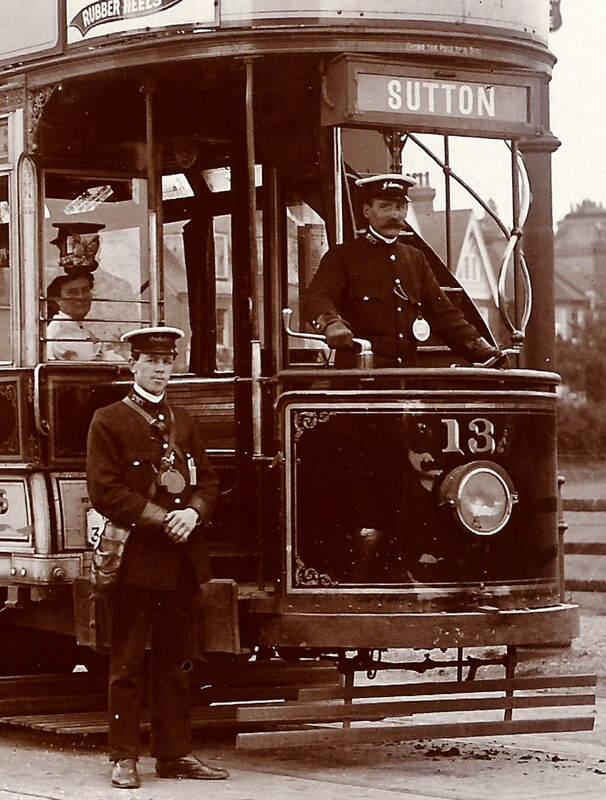 Although the conductor is wearing a script-lettering cap badge, the motorman is not; both men appear to be wearing the standard BET 'Magnet & Wheel’ cap badge. Winding away up behind the tram is Duppas Hill. Photo courtesy of the Tramways and Light Railway Society, with particular thanks to Richard Rosa, and facilitated by Ashley Birch (British Tramways Buttons and Badges) - thanks also to John Clarke for identifying the location. ...... is wonderfully cropped, enhanced and enlarged to show that both men have script lettering cap badges, whilst the distinctive ‘Magnet & Wheel’ cap badge of the parent company - British Electric Traction - is completely absent. 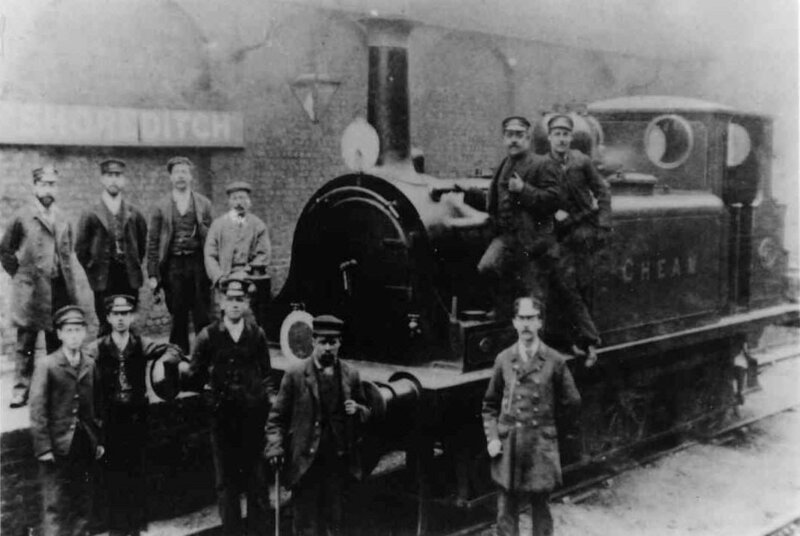 The motorman' appears to be wearing a Type DM1 Mechanical Power PSV badge. Photo courtesy of the Tramways and Light Railway Society, with particular thanks to Richard Rosa, and facilitated by Ashley Birch (British Tramways Buttons and Badges). Motorman at the controls of Tramcar No.3 on a service for Sutton in Stafford Road, Wallington, as it approaches the junction with Woodcote Road - the wall on the left is that of the old Presbyterian Church, knocked down in the 1990s in favour of a Sainsbury supermarket - photo undated. Note that he is wearing a double-breasted crossover style of tunic, and his cap appears to have both a 'Magnet & Wheel' and a script-lettering cap badge. 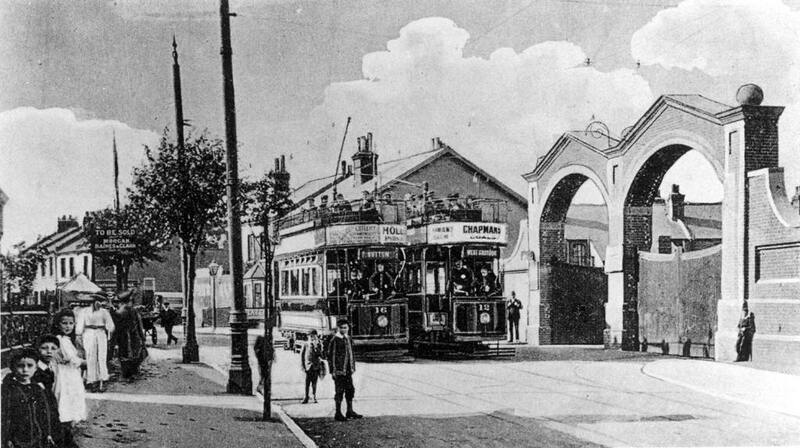 Photo courtesy of the Tramways and Light Railway Society​, with particular thanks to David Voice, and facilitated by Ashley Birch (British Tramways Buttons and Badges) - thanks also to John Clarke for identifying the location. 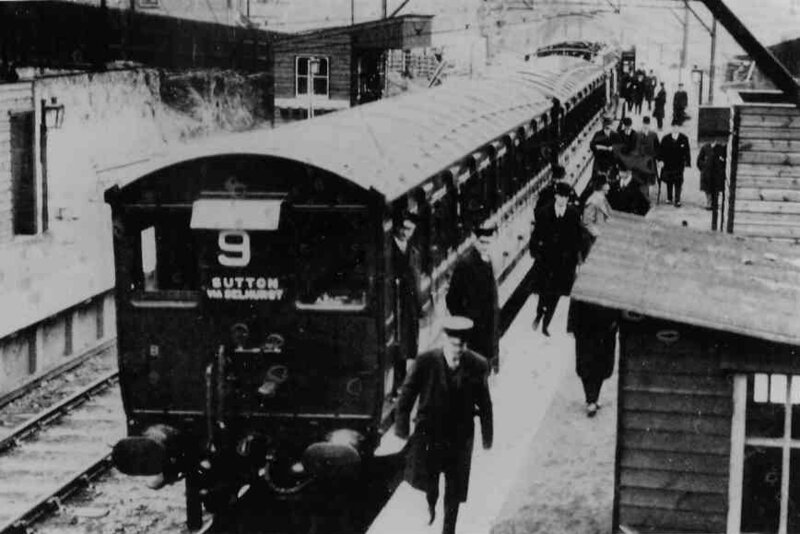 A view from Cheam station towards Sutton before the station was rebuilt in 1907. 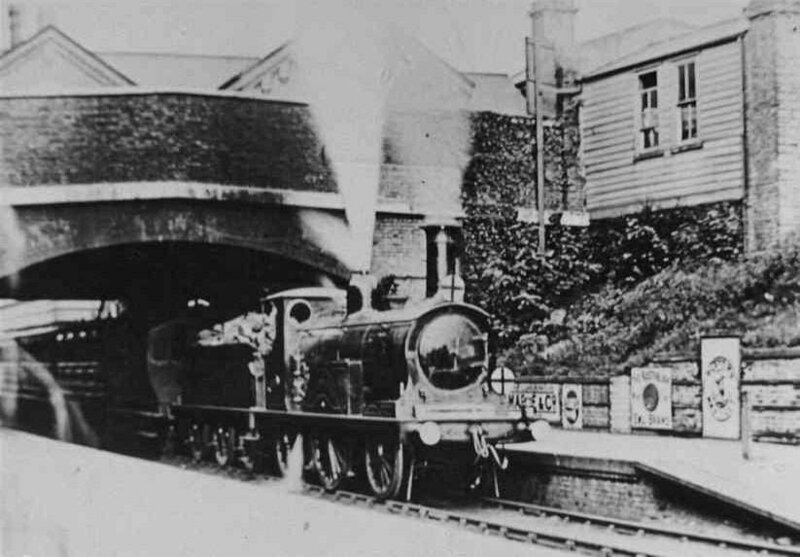 Cheam, pictured after it was rebuilt in 1907. The width of the gap between the platforms is a reminder that it was once planned to have a central island platform built at this location.